The turbine is installed in a manhole, in derivation of the earth reservoir working on constant level. The supply of water is made by a service clip in load of small diameter (40 mm) on the filling gravitating main. 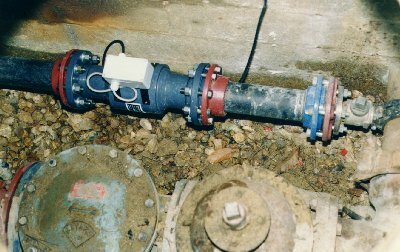 The output of the turbine is connected directly to the watermain going towards the distribution network. Hydraulic connection is made by two supports DB80. The turbine functions only during peak demand, i.e. approximately 4 to 5 hours per day. The produced electric power is stored in the battery of device HYDROPOWER, to supply permanently a level transmitter.